Can I post while on the trail from my phone? Used this recipe, which makes a massive amount. Consider halves or quarters. As suggested in this post, I added a cup of whey protein powder. 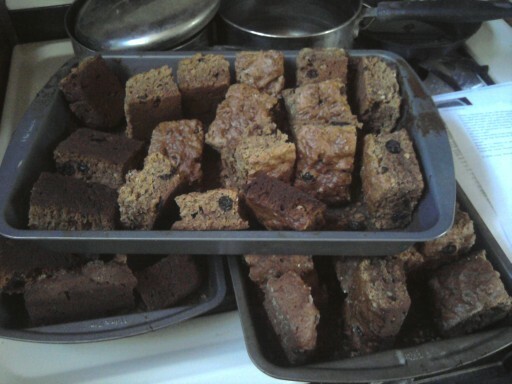 Before drying at 200F it tastes and smells exactly like gingerbread, with crunchy and chewy bits. 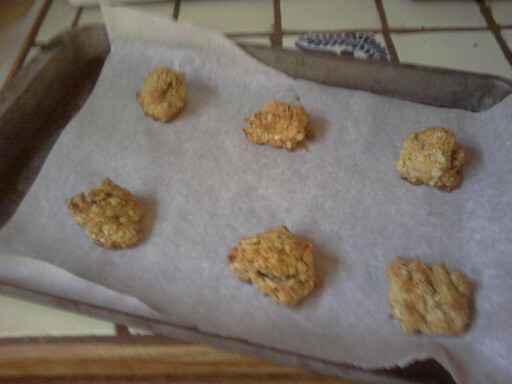 One might double the amount of dried fruit and nuts if desired. Cut into 2″ x 3″ pieces and spread out to dry at 200F, the result was very hard and will definitely require dunking in tea or cocoa to soften. Perhaps cutting into thinner slices a la biscotti prior to drying would work better. Although not altogether practical as a modern trail food, I couldn’t resist baking some for historical purposes. Eat some while passing near Civil War battlefields. Impressively hard when baked, these tiles will survive any jolts inside your food bag. If weevils are present, one should revel in the historical authenticity. Tasty, but surely these are not sturdy enough to survive a long journey in your pack without major breakage. 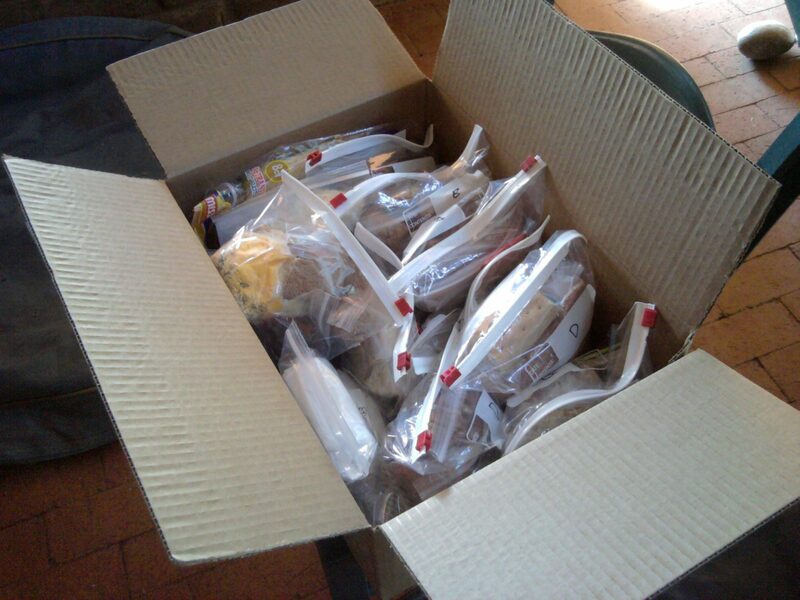 Carefully packed in biscuit tins, they are known to survive an ocean journey, but perhaps not your food bag sans tin. 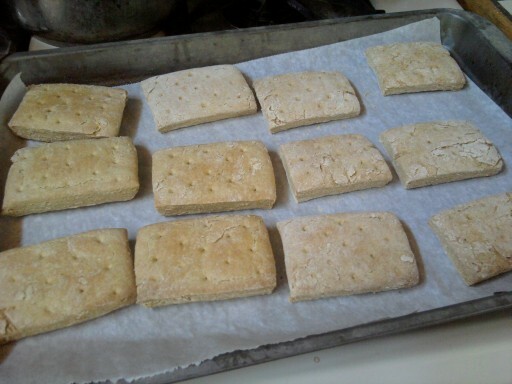 I will try drying out a few as with Logan Bread, to see if that makes them more impervious. In PCG, I describe adding boiling water to a zip freezer bag and waiting 5 minutes for the meal to cook/re-hydrate. 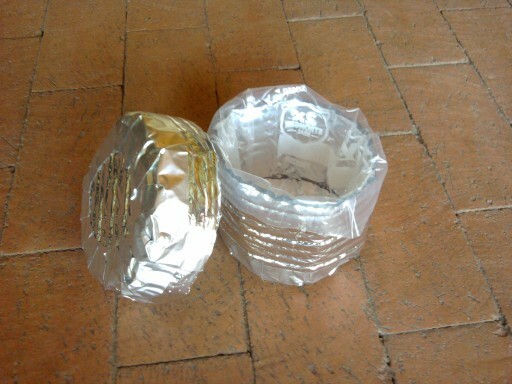 A special container was described, with a small piece of corrugated cardboard for heat insulation on the bottom to make it comfortable to hold in one hand. 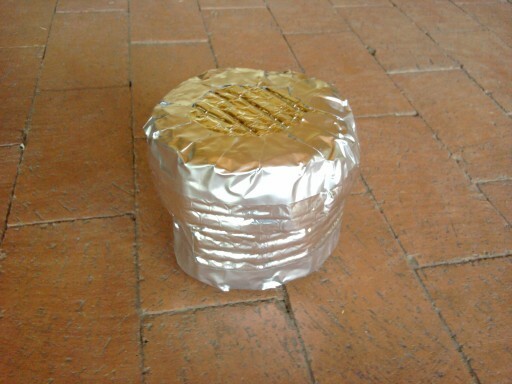 For this trip I wanted to upgrade to a food cozy to keep food warm longer. I still want to cook in a freezer bag, not a pot, to eliminate washing dishes. Serendipitously my choice of pots, Evernew Titanium ECA-266 500mL mug pot, is close enough in key dimensions to the quart size bag I would be using, so the food cozy can also double as a pot cozy. I was going to use close cell foam from an old sleeping pad as insulation, until an Internet search showed many hikers are now using Reflectix(tm) insulation, available at big-box home stores, which resembles bubble-wrap with foil facing on both sides. 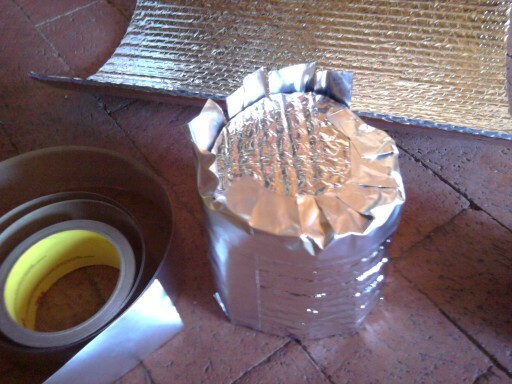 Very light weight, the material is easy to cut with scissors and fastens together nicely with foil tape. Following the data-driven nature of this blog, I should have built cozies out of different materials (Reflectix, closed cell foam, and perhaps bubble wrap) and measured the temperature change in each, but sadly I’m running out of time. It’s less than a week until my flight and copious amounts of trip preparation still remain. This video shows some temperature measurements. 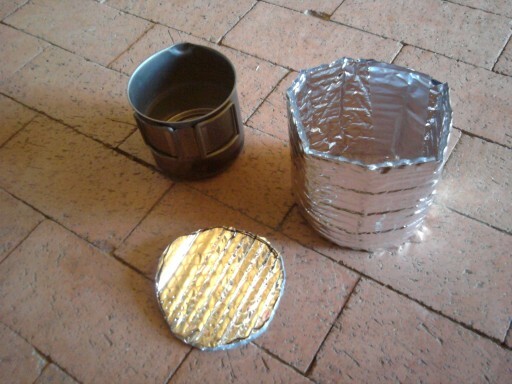 The series of photos shows how the pot cozy goes together, rather self-explanatory. No template is needed other than the pot to measure against. The materials are flexible and forgiving, so measurements need not be precise. My cozy weighs 25 grams. Some weight reduction might be had by reducing tape, although I would prefer to do some field testing before trimming much more. A word about freezer bags: Different brands may have different dimensions. Hefty brand quart slider freezer bags are labeled as 7 inches by 8 inches, but 7 is height. Another brand is listed as 7 x 7 3/4 inches, but the 7 refers to the width. The Hefty bag fits well in my cozy, but the other brand isn’t quite wide enough to fold over the top of the lip. My preference is to tape the bottom of the bag to be square-bottomed (see PCG) and to cut off the zipper and use a twist-tie. If one prefers to keep the zip closure, the bag still folds over the top of my cozy if you remove the slider. To operate, place the freezer bag in the cozy, with the top of the bag folded down over the top edge of the cozy, pour in boiling water, and put on the lid. Alternatively, tie the bag closed with a twist-tie, and then add the lid. Wait five minutes or so for the meal to cook, and enjoy a warm meal. Consume with the bag still in the cozy, holding with one hand and a spoon in the other. To measure the effect of the cozy, I added one cup boiling water (at 5000 feet altitude, 78F ambient air temperature) to two identical zip freezer bags (with square bottom modification mentioned above), with one bag bare on the counter-top closed with a twist-tie, and one bag in a cozy. After five minutes, the cozy bag water measured 181F, and the nekkid bag content was at 160F. 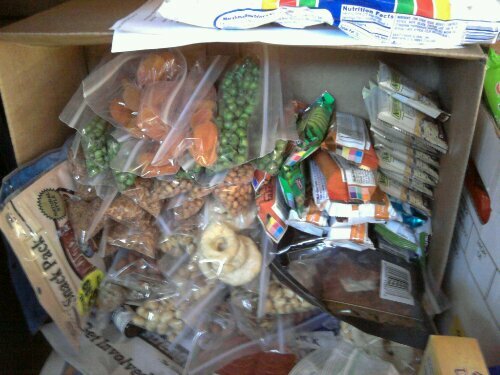 My first food box was mailed Friday, May 25, two weeks ahead of estimated pick up date. I plan on one week parcel post ground delivery time, and one week window either side of estimated delivery date. General delivery parcels might only be saved for two weeks before discarding. Five days worth of food and supplies, ready to go. I had feared my box selection at 12x16x6 inches was overly large, but perhaps I am closer than I thought. With careful packing the standard flat-rate USPS Priority Mail box size at 12x12x6 inches would probably still work. I am shipping alcohol fuel, which involves extra postal regulations. 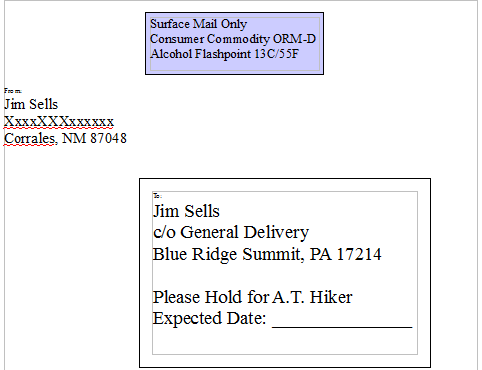 A week earlier I visited the post office and explained to the clerk that I was hiking the Trail and planned to ship small quantities of alcohol fuel by ground delivery, and whether I had accounted for all regulations with my label and packaging. When we mailed the first box we happened to get the same postal clerk, who remembered me and what I planned.